​PC Pitstop is looking at redoing the forums webpage, but we want your feedback before we make too many changes. ​First, we are discussing minor changes. These would be focused on membership rewards. This would include featuring special forums for members only, and potentially a contest for the best tip shared each month by members. There would also still be the categories for Networks, Viruses, etc. Essentially we want to organize the page to make it more functional. However, we want to be sure this is something the current users agree could be beneficial. Let us know what you think, and what ideas you may have to help make our forums better for our users! She is an Administrator, and I will unlock your topic. Please put them in the proper place in the future. How about a tab under our avatar to display our system specs. It would be a great help if we knew what hardware a member was using if they asked for help with something. 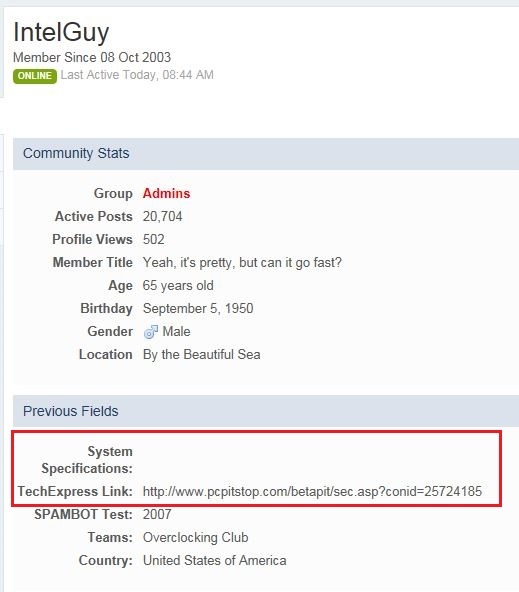 There is already a place for that information in the user's profile, which can be accessed by clicking on their username, as well as a place to add a link to an OverDrive test, which contains a ton of information. Clicking on TechExpress under the avatar brings up the OverDrive results. With all due respect IG, how am I supposed to input my system specs in this 1/8 in space that it gives me? Clicking the "menu" button just gives a blue square about the size of a small pea. Thanks for pointing this out caintry. Refresh and give it another try as I altered the setting in the ACP. What problem are you having with changing your password for the forums?